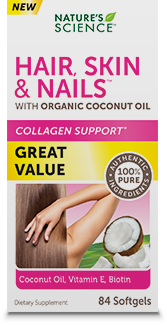 Nature's Science HAIR, SKIN & NAILS with ORGANIC COCONUT OIL™ is natural formula that provides the benefits of coconut oil along with nutrients to help maintain health hair, skin and nails and support collagen formation*. WHAT IS HAIR, SKIN & NAILS with ORGANIC COCONUT OIL? Nature's Science HAIR, SKIN & NAILS with ORGANIC COCONUT OIL ™ contains pure and authentic ingredients such coconut oil, Vitamin E and Biotin.